Papua New Guineans are all about sharing – especially food. Giving food and other gifts is the way that they build and maintain relationships. We felt that we did a whole lot more receiving than giving during our time in Kundipoi. Now I know we said that we would be eating tinned meat and rice (which we did), but pretty much every day someone would bring us some food. Kundipoi is at a high enough altitude that there isn’t much variety in the crops. The staples are sweet potatoes, cabbage and green onions. Some people also try to grow taro, potatoes and bananas, but the results aren’t always good. We constantly had a box full of sweet potatoes and an intimidating mound of green onions in our kitchen, which seemed to replenish itself magically whenever we used up any. We gave away as much as we could to the translation team. And Brian soon became frustrated with finding green onions in EVERYTHING. The real blessing though came in the form of fresh meat. 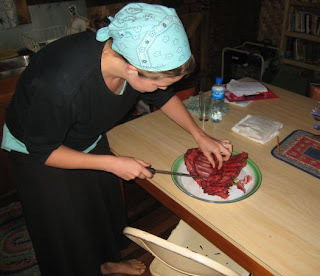 Papua New Guineans generally don’t have abus (animal) with every meal. It’s more for special occasions. One day a woman came to the house with a plastic shopping bag. Inside was a fresh rack of pork ribs. We were really surprised, and so was Kerry, one of the translators. Very rarely do people kill pigs just to eat them. They are usually only killed for funerals, weddings, and other big celebrations. Kerry couldn’t think of any reason why someone would have killed a pig. We’re still not sure if it was done on our behalf. We were also given two live chickens. 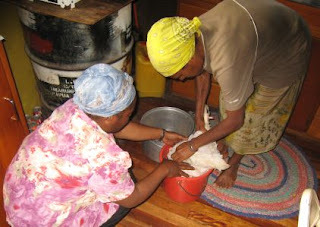 A live chicken costs 25 kina (about $9.50), which is substantial, considering that an unskilled laborer makes about K1.50 per hour. Jecobeth (who brought one of the chickens) and Kerry butchered it for us, right in the kitchen. Then we boiled it with sweet potatoes, ginger and greens, and invited some friends over for dinner.